A marine engineer is responsible for maintaining and operating the machinery and electrical and electronic equipment on board ship. "In a nutshell, we are responsible for the safe and efficient running of the engine-room, which includes the operating, the maintenance and the repair of the engines, and all the equipment in the engine-room." "Knowledge of computers is critical. There are maintenance programmes generated by computer, and most of the new ships' engines are controlled by computer." "You need to be able to operate under pressure. If something goes wrong, you've got to look at the situation in a cool and calm manner so you can make a rational decision." Marine engineers need to be fit, healthy and strong as heavy lifting may be required. They should also have good eyesight (with or without glasses) and good co-ordination. Marine engineers are required to have School Certificate with at least a B2 grade in English and maths, although Sixth Form Certificate or a higher qualification is preferred. After working at sea for six months, trainees may apply for a first level Marine Engineering Certificate, which allows them to take charge of an engineering watch. Skills are learned on the job. "The biggest trouble is to get to sea. Most employers won't employ you unless you've got a marine certificate, and you can't get a certificate unless you get the sea time." Marine engineers work at sea in a ship's engine-room and on other parts of a ship. They may work on land as maintenance engineers in hospitals, hotels and powerstations. They often travel in New Zealand waters and may travel to overseas ports. Marine engineers work on ships in all weather conditions. Conditions are usually hot, noisy and messy. Workplaces may also be dangerous. Marine engineers frequently work in shifts or can be on-call. They may be away from home for long periods of time. 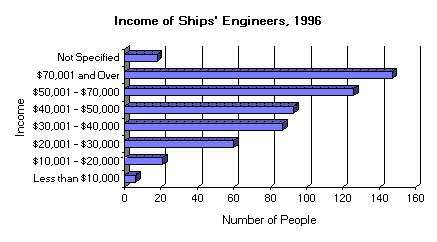 Salary varies, but marine engineers usually earn between about $53,000 and $120,000 per year.